If you thought that Tropaeoleum were simply called Nasturtiums then think again. 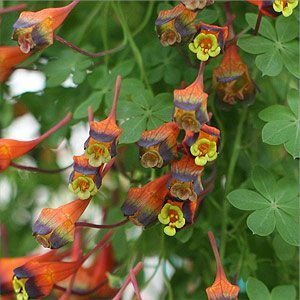 Tropaeolum a wonderful colourful genus originally from South and Central America. Although they best known for the common Nasturtium, many other garden worthy varieties are available. Seen as the realm of collectors we believe that this group of climbing and scrambling perennials are well worth exploring. Some with yellow flowers, others with multicoloured flowers they are not difficult to grow and will reward you with masses of colour, often in winter. T. pentaphyllum is a winter dormant climber. T. peregrinum is a yellow flowering species. T. speciosum or ‘Flame flower’ is a climbing plant with flame red flowers. T. brachyceras is from Chile and with its bright yellow flowers is a stunning plant. The easy ones Nasturtium ( T. Majus) you can find at most nurseries and garden centers, they also grow well from seed available online and in most nurseries. The other ones T. tricolor, speciosum and the yellow flowering T. Peregrinum or ‘Candy Creeper’ are very difficult to find at all.